A double domed sheet of skeletal muscle, located at the inferior most aspect of the rib cage. It separates the thoracic cavity from the abdominal cavity. Separates the thorax (chest) from the abdomen. The primary muscle used in inspiration and inhalation (breathing) and a very important spinal stabilizer. Diaphragm muscle is often pushed up superiorly through pregnancy and weight gain and can also cause dysfunction within stabilizing the spine. It can often lead to problems taking a full inhalation and exhalation in natural breath. 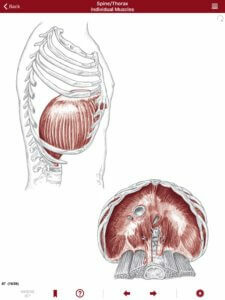 This creates many dysfunctions between the relationship of intra abdominal pressure and intra thoracic pressure. Individuals often have trouble breathing. Breath happens within the chest cavity instead of a full breath within the lungs. Often diagnosed as Exercise Induced Asthma. Acid Reflux is another common problem for individuals with diaphragm dysfunction as the esophagus goes through the diaphragm. If the diaphragm tightens around it this will limit the ability for your body to properly digest food and allow it to release into the stomach. Individuals have trouble connecting to the upper abdomen and stabilizing muscles of the thoracic spine. They will often gain strength and power from holding their breath which creates lack of oxygen to the brain and other systems causing a lightheaded or nauseous response. If tight and overactive it can inhibit the ability to have increased thoracic spinal mobility which also can create compensation and problems both above and below leading to lower back pain and/or shoulder and neck pain. Release the diaphragm as a facilitator in order to access other structural systems that are inhibited in performing their intended functionality. Follow up release with proper breathing and core activation exercises.